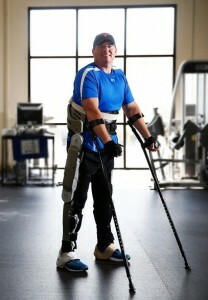 LP Accessible Technologies » Advanced exoskeleton promises more independence for people with SCI. Advanced exoskeleton promises more independence for people with SCI. The dream of regaining the ability to stand up and walk has come closer to reality for people paralyzed below the waist who thought they would never take another step. A team of engineers at Vanderbilt University’s Center for Intelligent Mechatronics has developed a powered exoskeleton that enables people with severe spinal cord injuries to stand, walk, sit and climb stairs. Its light weight, compact size and modular design promise to provide users with an unprecedented degree of independence. The university has several patents pending on the design and Parker Hannifin Corporation – a global leader in motion and control technologies – has signed an exclusive licensing agreement to develop a commercial version of the device, which it plans on introducing in 2014. According to the National Spinal Cord Injury Statistical Center, somewhere between 236,000 to 327,000 people in the U.S. are living with serious spinal cord injuries. About 155,000 have paraplegia. The average age at injury is 41 and the estimated lifetime cost when it happens to a person of 50 ranges from $1.1 million to $2.5 million. Until recently “wearable robots” were the stuff of science fiction. In the last 10 years, however, advances in robotics, microelectronics, battery and electric motor technologies advanced to the point where it has become practical to develop exoskeletons to aid people with disabilities. In fact, two companies – Argo Medical Technologies Ltd. in Israel and Ekso Bionics in Berkeley, Calif. – have developed products of this type and are marketing them in the U.S. These devices act like an external skeleton. They strap in tightly around the torso. Rigid supports are strapped to the legs and extend from the hip to the knee and from the knee to the foot. The hip and knee joints are driven by computer-controlled electric motors powered by advanced batteries. Patients use the powered apparatus with walkers or forearm crutches to maintain their balance. Goldfarb developed the system with funding from the National Institutes of Health and with the assistance of research engineer Don Truex, graduate students Hugo Quintero, Spencer Murray and Kevin Ha, and Ryan Farris, a former student who now works for Parker Hannifin. “My kids have started calling me ‘Ironman,’” said Brian Shaffer, who was completely paralyzed from the waist down in an automobile accident on Christmas night 2010. He has been testing the Vanderbilt apparatus at the Nashville-area satellite facility of the Shepherd Center. Based in Atlanta, Shepherd Center is one the leading hospitals for spinal cord and brain injury rehabilitation in the U.S. and has provided the Vanderbilt engineers with the clinical feedback they need to develop the device. “It’s unbelievable to stand up again. It takes concentration to use it at first but, once you catch on, it’s not that hard: The device does all the work. I don’t expect that it will completely replace the wheelchair, but there are some situations, like walking your daughter down the aisle at her wedding or sitting in the bleachers watching your son play football, where it will be priceless,” said Shaffer, who has two sons and two daughters. According to Hartigan, just getting people out of their wheelchairs and getting their bodies upright regularly can pay major health dividends. People who must rely on a wheelchair to move around can develop serious problems with their urinary, respiratory, cardiovascular and digestive systems, as well as getting osteoporosis, pressure sores, blood clots and other afflictions associated with lack of mobility. The risk for developing these conditions can be reduced considerably by regularly standing, moving and exercising their lower limbs. The Vanderbilt design has some unique characteristics that have led Hartigan and her colleagues at Shepherd Center to conclude that it has the most promise as a rehabilitative and home device. None of the exoskeletons have been approved yet for home use. But the Vanderbilt design has some intrinsic advantages. It has a modular design and is lighter and slimmer than the competition. As a result, it can provide its users with an unprecedented degree of independence. Users will be able to transport the compact device on the back of their wheelchair. When they reach a location where they want to walk, they will be able to put on the exoskeleton by themselves without getting out of the wheelchair. When they are done walking, they can sit back down in the same chair and take the device off or keep it on and propel the wheelchair to their next destination. The Vanderbilt exoskeleton weighs about 27 pounds, nearly half the weight of the other models that weigh around 45 pounds. The other models are also bulkier so most users wearing them cannot fit into a standard-sized wheelchair. The amount of robotic assistance adjusts automatically for users who have some muscle control in their legs. This allows them to use their own muscles while walking. When a user is totally paralyzed, the device does all the work. The other designs provide all the power all of the time. It is the only wearable robot that incorporates a proven rehabilitation technology called functional electrical stimulation. FES applies small electrical pulses to paralyzed muscles, causing them to contract and relax. FES can improve strength in the legs of people with incomplete paraplegia. For complete paraplegics, FES can improve circulation, change bone density and reduce muscle atrophy. There is also the matter of cost. The price tags of other rehabilitation model exoskeletons have been reported to be as high as $140,000 apiece, plus a hefty annual service fee. Parker Hannifin hasn’t set a price for the Vanderbilt exoskeleton, but Goldfarb is hopeful that its minimalist design combined with Parker Hannifin’s manufacturing capability will translate into a more affordable product. “It would be wonderful if we could get the price down to a level where individuals could afford them and insurance companies would cover them,” he said. Watch: Professor Michael Goldfarb’s personal reasons for working on robotics to help paralyzed people. The research was funded by a grant from the National Institute of Child Health and Human Development numbered R01HD059832.